We all know that French women don't get fat. But their famous je ne sais quoi comes from more than just body type--something anyone can master: the old-fashioned art cultivating our inner beauty, confidence, and unique personal style, at any age. From savoring the everyday beauty around you to engaging in captivating conversations, playing dress-up, hosting impromptu dinner parties under the stars, and of course mastering the art of French flirting, the lively and inspiring lessons in this “syllabus” will help you rediscover your beautiful, fierce, romantic, engaging best self—to attract the best of everything into your life. Ready to embark on the adventure of your life? 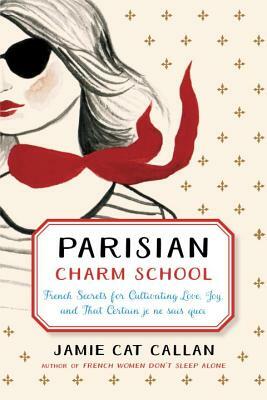 Parisian Charm School is in session…. "We can’t all live in Paris, but Jamie Cat Callan has shown us in her effervescent new book how to bring a little Paris into our own lives. Enchanting, wise, full of esprit—and delectable as a Laduree macaron." "A book full of grace, charm, and that truest of feminine virtues, intelligence. The subtitle for this book should be: 'Smart girls get more!'"